Mangrove forest around Marang at the east coast of the Malay Peninsula. 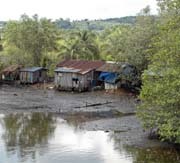 A very few decades ago the verymost of Southeast Asia's coasts and river mouthes were overgrown with dense mangrove forests. 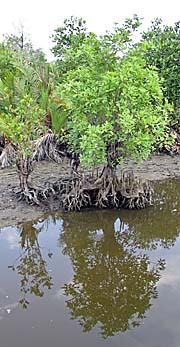 Mangrove trees are adapted to grow in saltwater; other kinds of trees couldn't survive in the swampy, saline coastlines. In Southeast Asia evolved about fifty different kinds of mangroves - even the Nipa palm is a mangrove tree. They provide a rich habitate for a lot of animals and are a fertile hatchery for fish. A thick belt of mangroves along a coast is also a protection for the land against erosion and floods; even tsunamis are (at least partially) blocked by mangrove forests. Additionally they have a filtering effect on sediments and nutrients in the water. Generally, 'mangrove' is a term for tropical and subtropical trees and shrubs who grow in saline swamps. They include a wide variety of different plants. What they have in common is that it's crucial for their survival that the water temperature doesn't drop below 20 degree celsius. However, a given mangrove forest itself usually consists of a very limited number of mangrove species; often it's only two or three, and the appearence of such a forest is quite homogenous. More specific, 'true mangroves' are trees of the Rhizophora family. 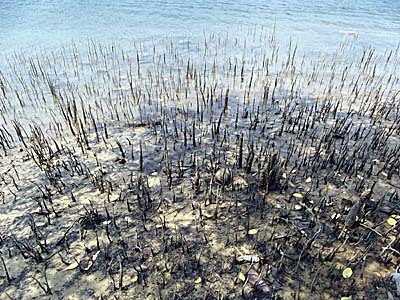 The coastal, saline silt does not provide the necessary oxygen for plants. Mangroves therefore evolved aerial roots for breathing. The air is piped further through the roots. Image by Asienreisender 2014, Cambodian south coast. 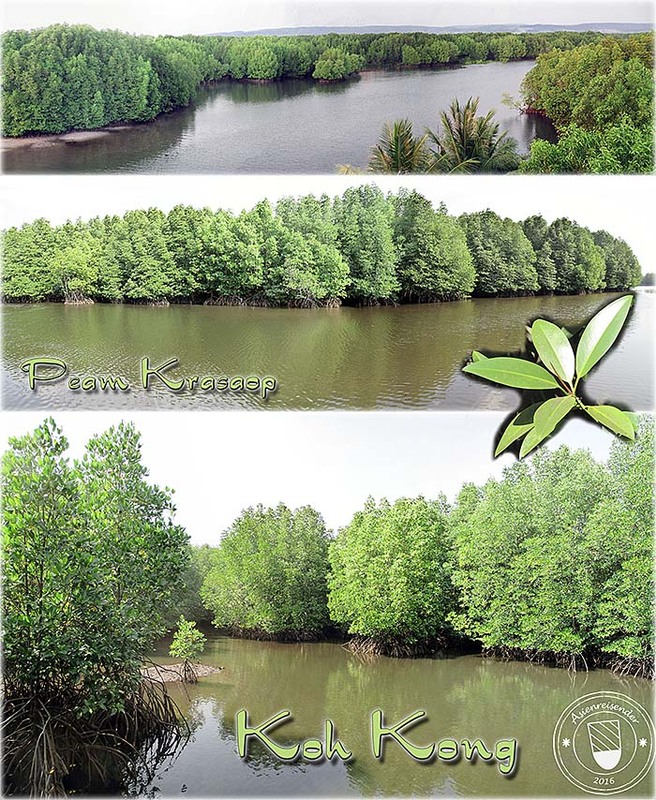 The widest variety of mangroves appears in the Malay Archipelago, namely Malaysia and Indonesia. However, Indonesia's huge mangrove forests are by 48% categorized as 'moderately damaged' and another 23% are 'badly damaged'. The process of destruction is certainly increasingly ongoing. 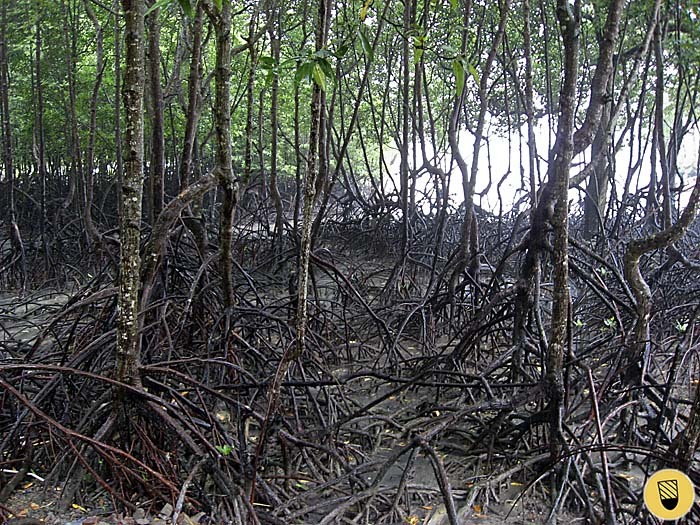 Mangroves as an ecosystem are an intersection of marine and terrestric life. 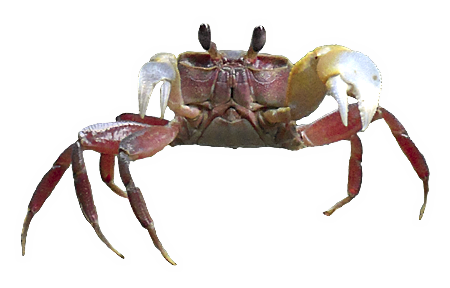 While the upper levels of the mangroves are inhabited by insects, reptiles, mammals and birds, the roots in the saltwater are hosting a great deal of fish, crabs, clam, snales and a lot of other water animals and organisms. Depending on the environment mangroves grow either pretty small or, under better circumstances, several meters, sometimes between five and over twenty meters. 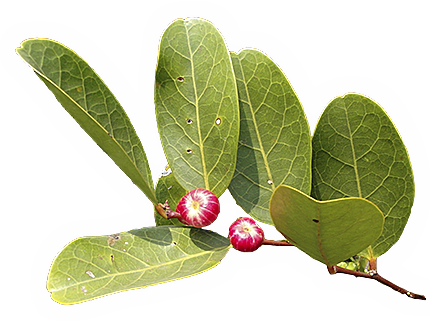 Some mangrove species developed the ability to expel salt through their leaves. Ko Chang in the Andaman Sea is one of many islands with long and dense mangrove coasts. 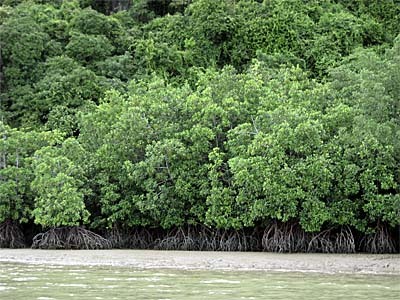 Mangrove forests are covering much of the long shores along the Andaman Sea. Ranong Province in Thailand hosts part of the last large and consistent mangrove biotopes in Southeast Asia. Also reforestation takes place here. 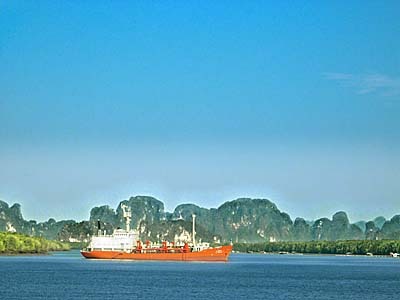 The mangrove coasts here expand for hundreds of kilometers further north of Ranong and Kawthaung along the Burmese coast. As well as all other ecosystems on earth, mangrove forests are nowadays under pressure; development and industrialization is changing all landscapes rapidly. Expanding urbanization along coastlines strikes the nature. Mangrove forests are shrinking worldwide. The situation in whole (tropical) Asia is a dramatical annual loss of mangrove forests by 1.52% of it's original size. That might be the size of what it was fifty years ago, let's assume it's the size of Asia's mangrove forests in 1964. For the next years until 2025 another 25% loss of mangroves is expected (globally) by experts. 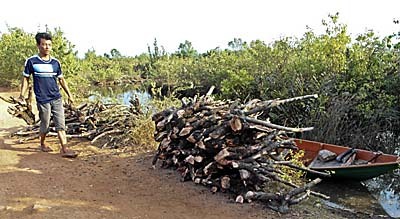 Traditionally, mangrove wood is used as a source for charcoal production, or directly as firewood. Sometimes mangrove wood is used as building material for simple constructions. 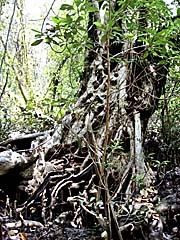 Mangrove bark is also usable for tannin production. Local communities never saw mangroves as something more than a kind of low-productive wasteland. The link to fertile fishing-grounds was long not realized. 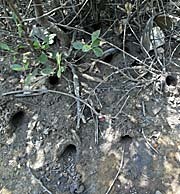 Nevertheless, people always found food in the coastal mangrove landscapes. With growing tourism and a developing touristic infrastructure, mangrove forests are often cleared for the sake of resorts and sand beaches. Agriculture is another cause for the removal of mangrove forests. For example, huge salt salines coin the coastlines around Kampot in Cambodia. That's an old industry here, but it expanded in the last years. In other regions the mangroves fall for the sake of rice farming, as to see for example east of Ream National Park in Sihanoukville. 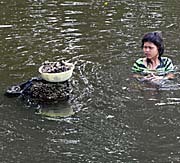 A severe threat for the mangrove ecosystem is the expansion of aquaculture, namely shrimp farms. In Thailand alone the mangrove forests have been halved in the time from 1975-1993. Shrimp production became very popular and was for a time promoted by credits from the World Bank. Shrimp farms in Ranong Province, Thailand. Shrimp farms are particularly problematic. They are preferably installed into the terrain of mangrove forests. The shrimps in the large monocultures are vulnerable for various diseases. The heavy use of chemicals and antibiotics is very polluting. Frequent water exchange in the pools leads to a considerable pollution of the coastal waters. The 'life expectancy' of a shrimp farm is short, after three to ten years they are no more productive and have to be given up. However, the area is so long-term polluted afterwards that the mangroves barely come back. Where mangrove forests are cut, the productivity of fisheries is decreasing drastically. 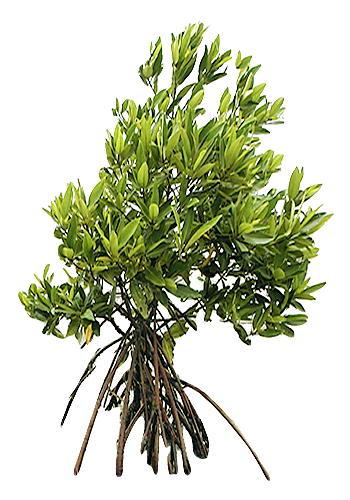 Global warming and the rise of the sea level is another threat for the global mangrove forests. 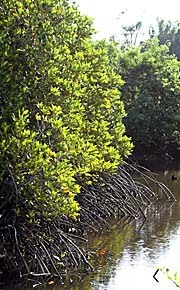 Particularly on flat coastlines or low islands the mangroves are endangered when the sea level rises. Inside a mangrove forest at the coast of Trang Province, south Thailand. It's practically impassable. Now it's low tide; later, when the water is coming in, the roots are completely below the water surface.